The strings of the pedal harp are tuned to a diatonic scale. Each note in an octave can be raised one semi-tone by using any of three devices know as the crochet, the béquille or the fourchette mechanism. A harp having the crochet mechanism will have a crochet placed on the neck adjacent to each string. These crochets are connected, in octaves, to the appropriate levers inside the harp neck. The levers, in turn, are connected via one of seven rods inside the harp column, to the appropriate pedal. If, for example, he F pedal is pressed down, all the F strings (by action of the rod, the levers and the crochets) will be raised to F-sharp. The béquille mechanism functions in the same manner as the crochet mechanism. However, when the fourchette mechanism is used, the appropriate levers are placed below (rather than inside) the harp neck, and they are hidden from view by brass plates placed on either side of the harp neck. When turned in the key of E-flat major, the single action pedal harp, by use of the appropriate pedal combination, can theoretically be played in eight major and five minor keys. Crochet – a little flag-like device. Inventor unknown; used by most single action pedal harp makers from about 1760 to about 1820. When a pedal is pressed down the crochet presses the string inward against a small individual bridge, thereby raising the string pitch one semi-tone. 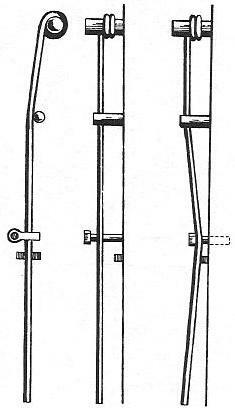 Béquille – a little crutch-ended device, used in pairs. Invented by the Cousineau’s and use chiefly by them; in use from about 1780 to about 1820. When a pedal is pressed down the crutch ends press against either side of the string, thereby raising the string pitch one semi-tone. Fourchette – a disc fitted with two prongs or forks. Invented by Sebastien Erard; used by Erard and most later pedal harp makers from about 1784 to the present time. When a pedal is pressed down the disc turns, and the two prongs press against either side of the string, thereby raising the string pitch one semi-tone. In contrast to earlier mechanism action, this process did not pull the string out of alignment or adversely affect their tone quality.